Every Christmas I try to do some sort of project. Something new. Sometimes it turns into something real, and last for years. Sometimes it goes no where. Normally, I have an idea of what I’m going to attempt – usually it has been bugging me for months and I can’t wait till break to get it started. This year, I had none. But, I arrived home at my parent’s house in New Jersey and there it was waiting for me. 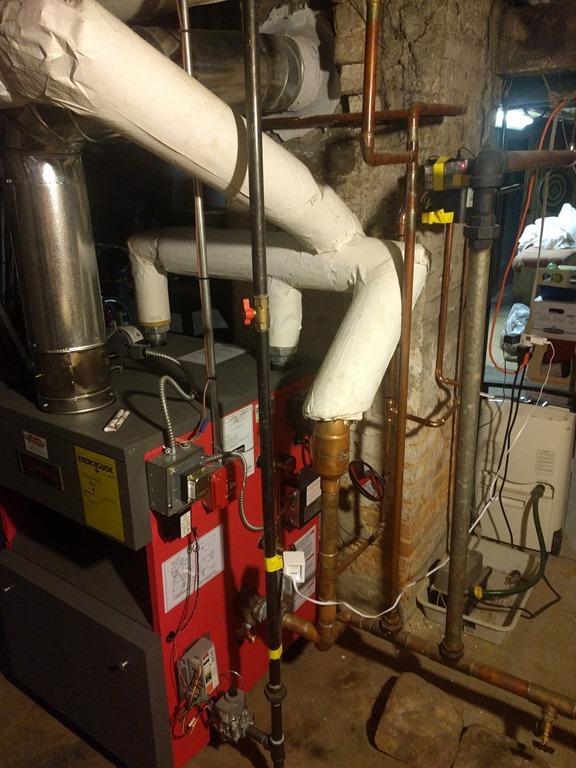 The house is old – more 200 yrs old – and the steam furnace had just been replaced. For those of you unfamiliar with this method of heating a house: it is noisy! The furnace boils water, and the steam is forced up through the pipes to cast iron radiators. The radiators hiss through valves as the air is forced up – an iconic sound from my childhood. Eventually, after traveling sometimes four floors, the super hot steam reaches the end of a radiator and the valve shuts off. The valves are cool – heat sensitive! The radiator, full of hot steam, then warms the room – and rather effectively. The bane of this system, however, is that it can leak. And you have no idea where the leak is in the whole house! The only way you know: the furnace reservoir needs refilling too often. So… the problem: how to detect the reservoir needs refilling? Especially with this new modern furnace which can automatically refill its resevoir. Me: Oh, look, there is a little LED that comes on when the automatic refilling system comes on! I can watch that! Dad: Oh, look, there is a little light that comes on when the water level is low. We can watch that. Dad’s choice of tools: a wifi cam that is triggered by noise. Me: A Raspberry Pi 3, a photo-resistor, and a capacitor. Hahahaha. Game on! What’s funny? Neither of us have detected a water-refill since we started this project. The first picture at the right you can see both of our devices – in the foreground taped to the gas input line is the CAM watching the water refill light through a mirror, and in the background (look for the yellow tape) is the Pi taped to the refill controller (and the capacitor and sensor hanging down looking at the LED on the bottom of the box). I chose the Pi because I’ve used it once before – for a Spotify end-point. But never for anything that it is designed for. An Arduino is almost certainly better suited to this – but I wasn’t confident that I could get it up and running in the 3 days I had to make this (including time for ordering and shipping of all parts from Amazon). It was a lot of fun! And consumed a bunch of time. “Hey, where is Gordon? He needs to come for Christmas dinner!” “Wait, are you working on Christmas day?” – for once I could answer that last one with a honest no! Hahaha. I had to solder! It has been a loooong time since I’ve done that. My first graduate student, whom I made learn how to solder before I let him graduate, would have laughed at how rusty my skills were! I was surprised to learn, at the start, that the Pi has no analog to digital converter. I stole a quick and dirty trick that lots of people have used to get around this problem: time how long it takes to charge a capacitor up with a photoresistor. This is probably the biggest source of noise in my system, but does for crude measurements. The Pi, by default, runs a full build of Linux. Also, python 3! I made full use of this – all my code is in python, and a bit in bash to help it get going. I used things like cron and pip – they were either there, or trivial to install. Really, for this project, I was never consious of the Pi being anything less than a full computer. At first I tried to write auto detection code – that would see any changes in the light levels and write them to a file… which was then served on a nginx simple webserver (seriously – that was about 2 lines of code to install). But the noise in the system plus the fact that we’ve not had a fill so I don’t know what my signal looks like yet… So, that code will have to be revised. In the end, I have to write a file with the raw data in it, and analyze that – at least, until I know what an actual signal looks like. So… how to get that data off the Pi – especially given that I can’t access it anymore now that I’ve left New Jersey? In the end I used some Python code to push the files to OneDrive. Other than figuring out how to deal with OAuth2, it was really easy (and I’m still not done fighting the authentication battle). What will happen if/when it fails? Well… I’ve recorded the commands my Dad will have to execute to get the new authentication files down there. Hopefully there isn’t going to be an expiration! To analyze the raw data I’ve used a new tool I’ve recently learned at work: numpy and Jupyter notebooks. They allow me to produce a plot like this one. The dip near the left hand side of the plot is my Dad shining the flashlight at my sensors to see if I could actually see anything. The joker. Pretty much the only thing I’d used before was Linux, and some very simple things with an older Raspberry Pi 2. If anyone is on the fence about this – I’d definately recommend trying it out. It is very easy and there are 1000’s of web pages with step by step instructions for most things you’ll want to do!